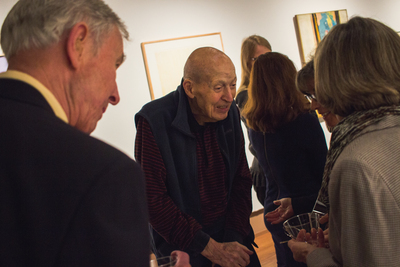 This exhibition by renowned American artist William Clutz celebrates his recent gift of artworks to Gettysburg College and is organized in partnership with the Washington County Museum of Fine Arts (WCMFA) in Hagerstown, Maryland. The exhibition features twenty-four pastels, drawings and large-scale paintings from the collections at the WCMFA, Mercersburg Academy, and Gettysburg College. Clutz arrived in New York in the 1950s as a peripatetic flâneur, walking through the streets of his Lower East Side neighborhood, astutely observing his fellow passers-by, and depicting them with a concerted awareness of the concentrated colors and painterly directness of the contemporary Abstract Expressionists.